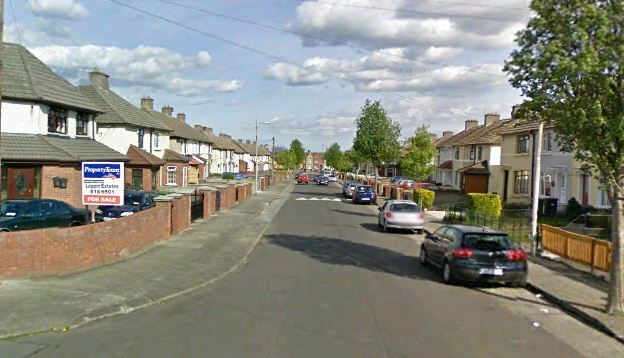 My dad once told me that all the people who lived on Swilly Road had come from the North Strand because they were bombed out of it by the Germans. Now I don’t really know if that’s true of every family on this road but it’s probably true of most of the original families. To us growing up in Cabra West this road always seemed a bit posher than the rest of the area because there were no great big gangs of kids or large families like ours living there. I remember Jimmy Ball who lived on Swilly Road, him and I were pals for a while because we were in Saint Finbar’s School together. I always loved it when his mother would allow him to ask me into their house. Theirs was the first television I ever saw. Jimmy and I would watch Booths and Saddles every Friday at about five o’clock. That’s how I became addicted to Cowboy films. I remember one time in particular when I was in their house and his mother wasn’t in the best of form. She had asked Jimmy to do something and when he didn’t move quick enough to do it she flung her shoe at him. Now the shoe had a mind of its own and when whizzing past Jimmy and straight towards the good China Cabinet. Now I’m sure the crash and the bang of broken glass could be heard all over Cabra. The next thing I knew was that I was sent home and never asked back again.